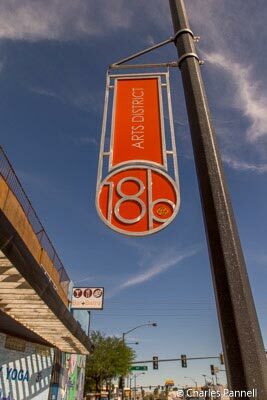 Although the Las Vegas Arts District is chocked full of unique galleries and trendy boutiques, a small section of this 18-block area offers folks a slightly offbeat and decidedly vintage experience. Tucked in between the antique shops that dot Main Street, you’ll also find a growing number of second hand and consignment shops that offer a refreshing blast from the past. Retro Vegas (www.retro-vegas.com), which is located at 1131 Main Street, tops the list, with a large assortment of vintage furniture and accessories. It’s like stepping back in time to the 1960s, as it’s packed with treasures that are bound to evoke childhood memories. Favorite items include a teak dining room set, a leopard love seat, tacky chandeliers of all shapes and sizes and even the requisite giant fork and spoon wall ornaments. There’s level access to the shop, and even though it’s filled to the brim with treasures, there’s still plenty of room for a wheelchair. Although this store isn’t part of any formal Las Vegas itinerary, it’s a fun place to browse, and surround yourself with memories. There’s also sidewalk access throughout the arts district, with curb-cuts at most corners. That said, there are a few stretches of sidewalk along Main Street that are in need of repair. Still it’s pretty doable for most folks, and it’s the perfect way to take a short jaunt down memory lane.